Below are pictures and information about our Cougar Sports Network broadcast commentators and staff. Each of our announcers are volunteers, who give generously of their time and effort to bring CSN broadcasts to your living room. The technical crew, including camera operators, audio engineer, instant replay operator, character generator, technical director and director, consists entirely of Asheville City Schools instructors, students, graduates, and volunteers. Doug Piercy (Center) Doug Piercy joined the Cougar Sports Network in 1999 as a football analyst, where he was involved with the Cougar Sports Network broadcast of the 3A State Championship Football game in Chapel Hill. Piercy has been involved with both live audiocasts and cable telecasts of Asheville High sports. He played football and basketball at Asheville High School, and continued his football career at Western Carolina University. 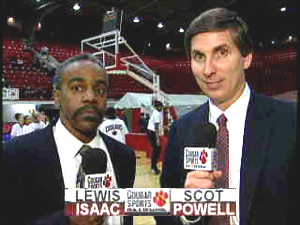 Lewis Isaac (Right) Lewis Isaac has been a member of the Cougar Sports Broadcast Team since 1999. Isaac has provided analysis for basketball, football, and baseball, and is CSN’s chief o­n-air statistician for football. He has been involved in the cable television broadcasts of the 2003, 2004, and 2005 NCHSAA 3A Women’s Basketball Finals. Isaac is a former multi-sport high school athlete. In addition to his broadcast experience, Isaac completed eight years o­n the Asheville City Board of Education in March 2005, ending his tenure as Vice-Chairman of the Board. 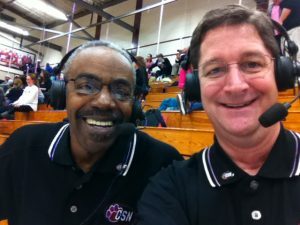 Lewis Isaac and Doug Mayer on set calling the Asheville vs. Roberson basketball men’s and women’s double header on January 15, 2013. Scot Powell has been a member of the Cougar Broadcast team since 2002. Powell is the basketball play-by-play voice of the Cougars for TV and does radio play-by-play for Cougar football o­n SportsRadio 1310 WISE. He played basketball at the collegiate level for the UNC Tar Heels, and has also been a sports reporter for WLOS-TV in Asheville. Doug Mayer joined the Cougar Sports Network team in 2013 providing play-by-play. Mayer brings experience having covered Asheville area sports for the Citizen-Times, Clear Channel, and is involved in regular productions of WMYA-TV 40 broadcasts and other regional sports television networks. “Soccer Bob” is the voice of Cougar Soccer o­n the Cougar Sports Network. Bio from Habitat for Soccer: Those of you who know Bobby, know that his energy and love of soccer drives and helps pull together soccer enthusiasts of all ages. Articulate and knowledgable about what’s going o­n! You may hear him announce a game or see an article published here detailing the accomplishments of our local talent. Graduate of Warren Wilson College and organizer of numerous soccer events including the local Tournament of Friends. Michael Luther is the Digital Media instructor at Asheville High School, and serves as the producer for Cougar Sports Network broadcasts. Luther coordinates the student crew and setup, and has also served as director. 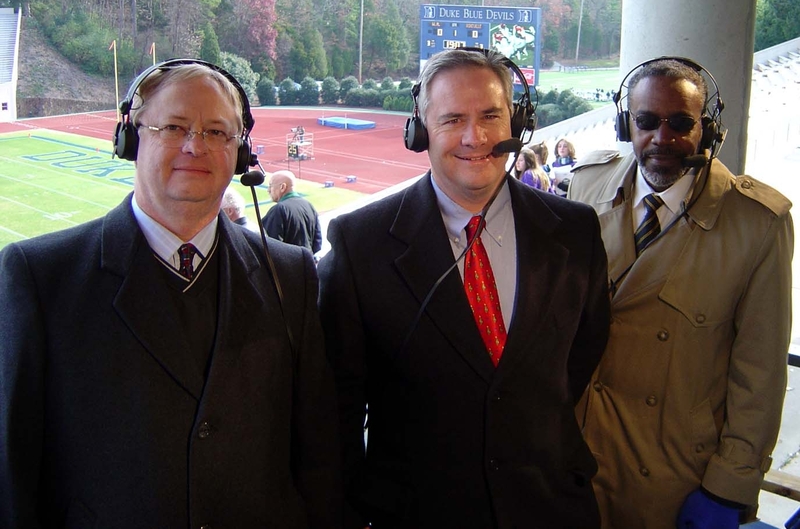 Luther has extensive broadcast experience with Appalachian State University, ESPN regional television, and Time Warner Cable sports television broadcasts.